Hello, everyone and welcome to the Higher Ed Marketing Lab. I’m your host, Jarrett Smith. Each episode, it’s my job to engage with the brightest minds in marketing and higher education to uncover the practical insights you can use to level up your institution’s marketing and enrollment efforts. 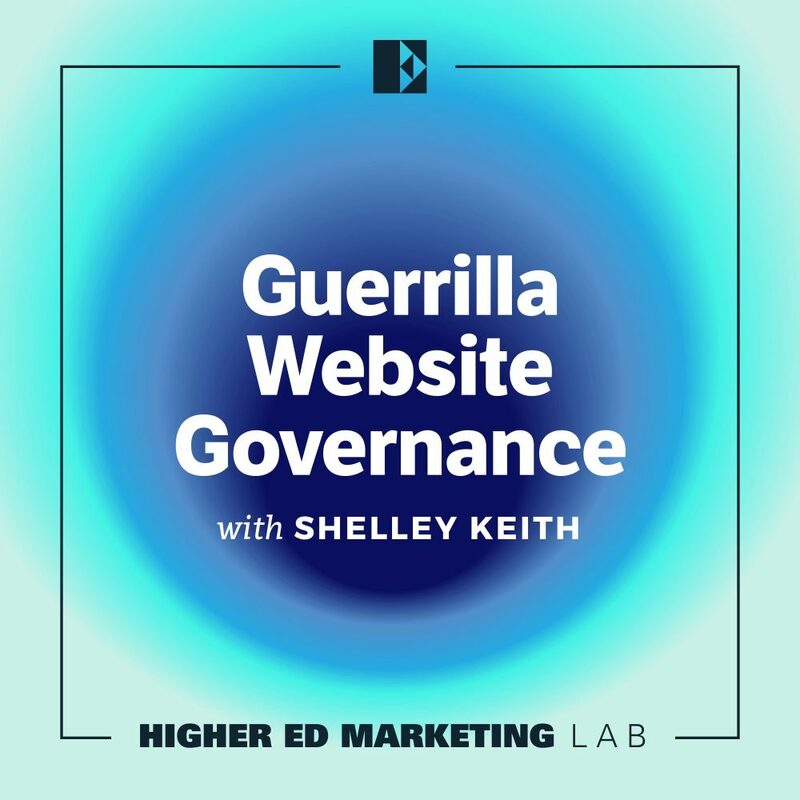 In this episode, we’ll be talking about website governance with Shelley Keith. Shelley’s a senior strategist at Modern Tribe, a web agency. Prior to joining Modern Tribe, Shelley spent over a decade managing digital communications in the university setting. Shelley brings a pragmatic perspective to website governance, and I think this conversation is particularly relevant for anyone who needs to exercise more control over their website, but may not have the formal authority or political support to do it. In this talk, we discuss how to use data backed storytelling to effectively engage with stakeholders, strategies for effectively partnering with content publishers whose website responsibilities fall on the other duties as assigned bucket, and how to prioritize your efforts when you have limited time and resources. This was a really interesting talk with some great practical tips. So without further ado, here’s my conversation with Shelley Keith. Shelley, welcome to the show. I can’t wait to talk to you about website governance. I’d like to kind of start by maybe just defining governance for folks because I know a lot of times when we talk web governance we tend to define it in terms of policy and procedure, which is obviously super important. That’s a big part of it, but I also know that you kind of think of it a little differently. How do you define and think about what website governance is? Well, my definition of governance comes out of environments where you don’t have a lot of resources or political will necessarily for the kind of policy and procedure that makes up a lot of kind of enterprise governance conversations. My approach tends to be very pragmatic, and I describe it as ensuring the site is working for the institution by effectively stewarding resources for optimal outcomes. And basically, it’s creating a stewardship model where people have some understanding of goals. And I have done a good job of tying their goals to overarching kind of governance rules that we need to adhere to for various reasons. How do you think about it working in that environment? How do you work within those constraints? What’s the strategy there? So my big thing is always to establish a repeatable process that includes being able to measure and show results, and then kind of shouting those results from the rooftops and using your successes to build more success. And really you have to be transparent and you have to really work with the stakeholders that you’re working within a partnership, whether in some cases, whether they recognize that’s what’s happening or not. And it’s very much about making them part of the process, figuring out what their goals are and helping them identify those things because oftentimes the website is this just kind of tacked on an additional thing that they have to do. And they know it’s important that they don’t know how to get results out of it and they don’t know what they should be trying for. So taking the things that they’re trying to do and having candid conversations with them and turning what they need, what kind of results they need from the website into measurable goals, and then helping them get to that point and then being able to show them success over time and turning those people into your champions. Yeah. So I’d love it if we could kind of dive into that conversation around interacting with stakeholders. Obviously, their feedback is very important. They need to be included in the process, but sometimes it can go awry. Never. It’s always perfect smooth sailing. We’re always on the same page. But what sort of tips or advice do you have about sort of going about gathering that feedback in the right way? What’s a good way or some strategies for going out and gathering that the right way? My last big experience with this was we were doing a complete ground-up rebuilds of a website for a variety of very serious institutional reasons, but it gave me an opportunity that some people don’t get to sit down with some of these things, really kind of key stakeholders and talk to them, put them through kind of a standard questionnaire that I developed that said, “Let’s talk about your goals. Let’s talk about the problems that you’re having with the website. Let’s talk about you’re hearing from the students that you’re working with. What are you hearing from across campus? Where are the friction points? What are the problems in your office?” And talking about, for instance, financial aid, just because they’re top of mind. They wanted to reduce phone calls and they had a huge numbers of families who didn’t understand process and they were going through, they just had a lot of like, because there’s so much information and so many steps associated with the financial aid process. We kind of established goals around smoothing out lives, smoothing out the process for some people, and first-generation parents and that was kind of the direction that we went. So I made it about not only helping with numbers and those kinds of things, but also about easing the workload on the financial aid office and making the content that they were publishing more valuable. Right? So that was part of the content strategy, but then establishing measures and getting them trained on basic things like chunking your content, using headers the right way and super basic stuff that they don’t know. You have to go into this recognizing that nobody wants to do a bad job, right? They just need to know what good is and oftentimes throwing rules at people just builds resentment. So figuring out how to tie the rules that you need them to follow to their outcomes and being able to show the benefit of it, so the why really matters a lot. Yeah. So that kind of reminds me, I know I’ve heard you talk about sort of the importance of that storytelling component. And sort of effectively using research and data to tell a really compelling story. Can you talk to me a little bit about that sort of the role of storytelling in this and what makes for good storytelling? Sure. Well, that’s a really good question. I mean, you can go into your president’s council and the board of directors and try to get support for things. But if what you’re doing is just talking about your problems without any kind of narrative, you’re just going to get a lot of people with glazed over eyes and they’ve been asked for money six times that day, that kind of thing. But if you tell a story around how, what you’re seeing, the problems that you’re describing, how that really impacts the university or the institution or the organization it makes a big difference. So if you go in and talk about bounce rates and also this other stuff it’s valuable and it’s true, but people don’t necessarily understand what that means, and the impact. Going in and talking about, you have to build a good story. One of the ones that I tell in my workshops the most often is going through our initial kind of site evaluation audit process. We got a lot of really useful information from the consultant that we hired to do that work, that I paired. So I had clear information about how content was failing and where, and then I took analytics and said this is the data for that. And then I took industry research so I was using No Limits data at the time, and talked about our target audience and the behaviors that they were doing, that they were exhibiting, and basically told a narrative about how this 77% of our prospective student body that we were targeting is coming into the fight somewhere that’s not the home page, which is the one piece of content that everybody cares about. And they’re coming into places where we’ve got this very specific data about how this content is failing. And this is their first impression of the institution. I was able to talk about bounce rates in terms of conversions, and not necessarily in that context or within that context but not in those terms, but I was able to talk about what kind of bounce rates and the kind of financial loss that we were seeing because we weren’t converting where we should be and that we needed to be doing a better job converting a certain level. I was able to really make a really compelling case for why this mattered and how it was going to be a beneficial undertaking for the institution to do better in this space. So that’s basically the whole thing, right, is being able to take all of these kinds of disparate pieces of information and take them and weave a narrative that tells the story in a way that engages the stakeholders that you need engaged, in such a way to help you move that forward. Nothing happens. This is not a non-issue. Yeah. Yeah, this is a non-issue, a sample size of one. How do you handle some of those instances? Well, I think there’s a couple of different things. One is if you’re talking about the other duties as assigned folks who are just plugging content into the website because they’re the ones who have the CMS access, but they’re being handed stuff from deans or directors or whoever, the people who actually are touching the website. Those folks I think have a different set of responsibilities and training requirements than the people who are telling them to do stuff. And for those people when I do training, when I do, especially CMS training, so what happens is I train on the wise, so I train on accessibility and SEO and basic our message architecture for the institution and how they should be referring to things and kind of essential style guide, and then I tie those things to the results that they’re trying to get as part of that training. Like SEO accessibility are really important, and they’re going to make a difference in your ability to drive traffic to your pages. So these are not only compliance requirements, but there’s a benefit to you. It’s paying attention to this training. And then I teach them how to use the CMS. So before they get to the how, before they get to the hands-on piece, they have to go through the why. And part of that is, yes, you want them, you want them educated, and you want them to have a concept of why you want to be able to teach them why things are important. But you also are building accountability. So I have now trained you in, and I do kind of on-demand online training, and so it’s a video and contents and then a quiz and the quizzes are meant to show that this person did complete this course successfully. They did retain the information for at least long enough to take a quiz, and I now have proof that this person knows that they can’t embed an image with text in it on the page without taking additional steps, that kind of thing. So there’s that for kind of the oversight, and the governance piece. And then there’s the support that those folks need to be able to, now that they know better when they get this, this edict down from on high that they need to do something, and then they now know that, that’s going to be problematic. It’s got legal implications. It’s got assessability applications, it’s whatever, it’s a copyright implications, they’re able to kind of go, “Well, maybe not.” And part of the empowering them to be able to do that is it’s part of training, kind of letting them know the legal implications and that their name is the one on the blog that says that this change was made, right? So they’re the ones that I’m coming to and then providing backup support for them because they don’t need to be the one to necessarily stand up and go, “No, we can’t do that,” but they do need to know that they can come to me and I can be the one to go to their upper-level folks and go, “Let’s find a different way to do this.” And I think that that kind of all the way around and you’re very rarely going to get those kind of upper-level folks through requirements training, through compliance training. Right? It’s not going to happen, but if you could get to people who were actually touching the website, you can make a huge leap in being able to better support the overall, all of the stakeholders and all of the goals that they’re trying to accomplish and have had more of a pull on the pulse of what’s going on. Yeah. Well, I love that approach, Shelley, and I love how when we think about compliance and some of the compliance implications with websites, it’s, obviously, the stick or in some cases the baseball bat that you’re kind of scaring people here, but I think your comment about nobody wants to fail. Everybody wants to succeed and no professor wants to publish content out in the web and then have nobody look at it. So by tying these best practices and showing how your interests are aligned with their interests, it’s such a smart way to kind of work with what they’re already trying to do. I know in any sufficiently large organization they’re going to be times where you have maybe certain segments of folks though that despite your best efforts are going to kind of dig in their heels. They’re not really going to be supportive. How do you approach those situations? So I call this my 20/60/20 rule, so you’re going to have 20% of your population who are super jazzed, super onboard. These are your immediate, they’re super excited that anybody’s doing anything with this mess right there. They’re glad that if somebody taking the lead, and these are your kind of first test subjects, right? These are the people that you build your initial successes with and start touting those to build the rest of your practice. And then there 60% who tends to be kind of, “Whatever, there’s been success. I guess I’ll play along, we’ll see how it goes, blah, blah blah.” And those are going to be the bulk of your folks. And usually, you can make pretty significant headway in that group. And then there’s going to be that other 20% who want nothing to do with it. “You’re wrong. You don’t know what you’re doing, you’re,” whatever the that they’ve decided, you’re not going to move that needle, right. That’s not the place to put your energy. And that’s kind of, I identify those as quickly as I can and just kind of go, “All right, you do what you need to do. And if you cross a hill that I’m going to die on, then we’ll interact. But I’m not going to put a ton of energy into trying to bring you around when I could be celebrating all of these successes with all these other folks.” So put your energy where it’s going to actually be beneficial to your sanity in the institution. So it’s almost like a governance judo in a sense. Go with where the energy is already going. Do you have any sort of parting advice for anybody who maybe is kind of down in the weeds? They realize, “Okay, I know I could benefit from asserting a little more control over the website and not necessarily the power to do it.” Do you have any advice for them in terms of where to start or how to maybe take some baby steps? Yeah, for sure. I not only call this noninvasive governance, I also call it gorilla governance. Because oftentimes the work that I do is very much like putting spinach and brownies. You’re just kind of fitting stuff in under the radar to get results that you can then later talk about. I would say the primary, like the number one thing that you need to do, is figure out what goal you’re working toward, what is it that you’re trying to accomplish initially? And then figure out the steps that you need to do to get there. And I would take stakeholder feedback, and user expectations, and institutional goals. Find an in, find a friction point that you can help solve and then work a repeatable process. Build empathy with the people that you’re working with. Find how you can help them and builds a connection and do work to enable their success. And it’s really about making them successful, getting their needle moved. So if you can do that, um, and, and do it consistently, then you’re well on your way to building a practice. That’s awesome. That’s really good advice. So, Shelley, the folks who want to connect with you. What’s the best place to do that? I have a Facebook group where I put all of my training materials and slide decks and presentations that I do and can be reached anytime there. And that is at facebook.com/groups/web governance. And that is just a quick and easy way to kind of immediately get access to everything all in one place. Then I will be at HighEdWeb in October this year doing a workshop on exactly this topic, and I’m on Twitter. I’m always on Twitter @shelleykeith. Yeah. Shelley, it’s been a real pleasure. Thank you so much. Thank you very much for having me. I’ve enjoyed it. The Higher Ed Marketing Lab is produced by Echo Delta, a full-service marketing firm dedicated to helping higher education institutions drive enrollment, increase yield, and captured donor’s attention. For more information, visit echodelta.co. If you enjoyed this episode, please subscribe and leave us a review on iTunes and as always, if you have questions, suggestions, episode ideas, or just want to reach out and say hi, drop us a line at podcast@echodelta.co. See you next time.